Real Housewives of Potomac’s Ashley Boalch Darby and WUSA9’s Markette Sheppard join prominent DC women from the media, marketing, and theater on judging panel. Washington, DC – Man of the District is excited to announce the judges, contestants, featured performer, and emcees that will appear at the May 7 event at Penn Social in Chinatown. Brandon Showell – The Virginia/Washington D.C. based artist, Brandon Showell has been at it for years. Born and raised in Virginia Beach, VA, Brandon made his professional debut with the group 4Shore. The group consisted of four solo artists who decided to form a power-house vocal group in high school, 2008. 4Shore began singing on platforms (Beach Street U.S.A) at the Virginia Beach Ocean Front that year and started to gain a lot of attention from locals and tourists. Their following grew on YouTube, as they posted impressive, raw, passionate covers such as Shai’s “If I Ever Fall in Love” and “Since You’ve Been Gone” by Day 26. Brandon and 4Shore were gaining even more momentum and in 2011 were contestants on Season 1 of FOX’s The X-Factor. The group worked with industry icons Simon Cowell, Pharrell Williams, L.A. Reed, Paula Abdul, and Nicole Scherzinger. After being eliminated from The X-Factor, 4Shore traveled to Atlanta, GA and continued to pursue a career as music artists. In 2012 Brandon decided to leave 4Shore and finish college in VA; the group dis-banded soon after, but remain great friends. 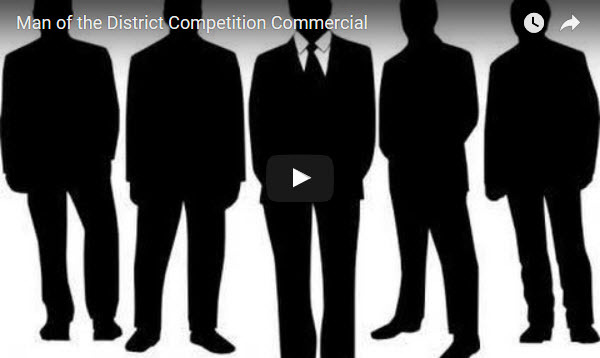 Each Man of the District contestant will present a 90–second talent of his choosing, model business wear, and answer an impromptu interview question related to the District. Half of the available points for competition are awarded for fundraising efforts and advance ticket sales. Man of the District is a 7-year-old event that has raised more than $70,000 for Children’s National with every dollar staying in the District. Funds support research and training, purchase equipment, and pay for uncompensated care, all in support of the center’s mission to save and improve the lives of as many children as possible. Tickets are now available for $15 via THIS LINK or at the door beginning at 6 p.m. Penn Social is located at 801 E Street Northwest. Don Michael Mendoza, Executive Artistic Director La-Ti-Do Productions in partnership with the Miss District of Columbia Scholarship Organization, produces the Man of the District competition. Washington, DC – Man of the District is excited to announce the judges, contestants, featured performer, and emcees that will appear at the May 22 event at Penn Social in Chinatown. Man of the District is a 6-year-old event that has raised more than $70,000 for Children’s National with every dollar staying in the District. Funds support research and training, purchase equipment, and pay for uncompensated care, all in support of the center’s mission to save and improve the lives of as many children as possible. Don Michael Mendoza, Executive Artistic Director of the La-Ti-Do DC/NYC cabaret series in partnership with the Miss District of Columbia Scholarship Organization, produces the Man of the District competition. Washington, DC – Penn Quarter will be even more handsome on Monday, May 16 as men compete to be named The 2016 Man of the District with all proceeds benefiting the Children’s National Medical Center. The 5-year-old event has raised more than $70,000 for Children’s National with every dollar staying in the District. Funds support research and training, purchase equipment, and pay for uncompensated care, all in support of the center’s mission to save and improve the lives of as many children as possible. Competition will begin at 7 p.m. Each candidate will present a 90–second talent of his choosing, model business wear, and answer an impromptu interview question related to the District. Half of the available points for competition are awarded for fundraising efforts and advance ticket sales. Haely Jardas, Miss District of Columbia 2016, and Don Michael Mendoza, Co-Founder and Executive Artistic Director of La–Ti–Dowill serve as masters of ceremonies. Tickets are available for $15 starting on Monday, April 25th via THIS LINK or at the door beginning at 6 p.m. Penn Social is located at 801 E Street Northwest.